Process to how fill the tanks for printer with ciss continuos self. Epson ensures the functioning of printers and full functioning if ever used for them original and authentic pots from this company inks, at least up to fifteen thousand copies which is where this machine is in warranty period we also recommend using original and genuine ink, these come with a confirmation code which you need to enter in the system of the printer whenever we make a refilled in ink tanks. We realize that your printer warranty period ends when this presents the error full ink tank, and after this message can refill Epson generic ink if we used the codes to reset Epson ink tanks. The procedure for filling the ink tanks is simple but we need to know, there are many factors to consider to avoid damaging the printer or the heads of it, the first thing you have to know is that these printers cannot print if the ink tanks are empty, if one of the ink tanks is empty or indicates that other tanks are empty but contain ink it will not print. First of all to start is recommended to have a fully operational printer, also keep your computer operating similarly to enter checking ink pots codes. 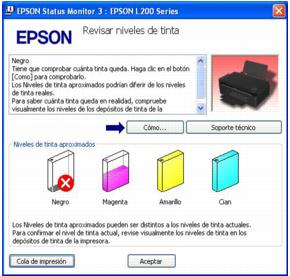 The time to refill the ink tanks is when our computer´s screen the message that we must fill printer ink tanks because the ink is below the line indicating that the ink is ready to be filled it will appear in our computer screen the following message appears. When the ink tanks or just an ink tank is empty and we got this in this screen, the process to be filled ink tank is by this way, click on how this moment on, the printer software will tell us exactly how to do the process. Something we have to be clear about is to use the printer ink tanks before this pass expiry date in this way we get better quality and better performance in the printer, keep the ink out of reach of small children, avoid spills ink when filling the ink tanks, and put a page below the ink tanks when we fill. We check that the power indicator on the printer is green, with this we identify that the printer is fully operational; this is before start filling the ink tanks. We have to disconnect the unit from ink tanks and put it down. If you have documentation of this printer where you can see more images is much better, if you need help please contact us. The image No. 1 indicates how is the ink tank from the start, the image # 2 shows how we need to put ink tank to fill it. 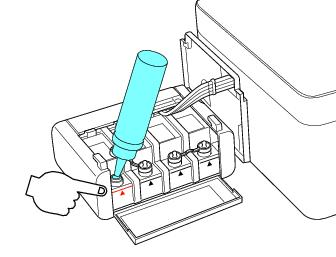 When we lay the ink tanks of the Epson printer we cannot pull these far from the printer, be careful that the ink tanks are supported by the printer through the tubes that carry the ink to the ink head, if you pull much you can damage ink system. One thing we have to be careful of is that when filling ink tank we are putting the ink in the right tank, it has to take a while and re-confirm perfectly where the ink should go. If we put the ink in the wrong tank , it is recommended to cover the other tanks and flip in the wrong tank for throw the ink we have to do this fast and without letting the ink to pass down, it is recommended even leave ink tank time to throw out all its entirety the ink until it goes. Do not supply alcohol or other substances with the hope that this is resolved, for it just do what we have discussed above. 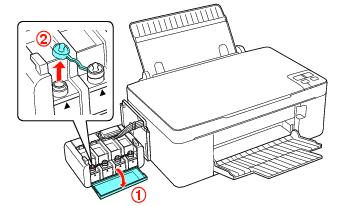 See how ink pots are uncovered to be filled with ink Epson printers_ L200. As mentioned above, be very careful when filling ink tank, confirm and re-confirm again not to put the ink in the wrong tank. If this happens remember that you have to completely empty the ink tank color from the color confused, you need help you should contact us by a comment in this post. Do not throw the top cap we see that it has been removed in the first image, if there is ink in the ink pot is necessary to keep it and save the ink, this is very useful. Fill the ink tanks to the top line of the ink tank as indicated in the following image. Make the filling of the tanks slowly and be very carefully to avoid ink spills, since removing the ink from skin and clothing is a bit difficult, as stated above can be put under the ink tanks one page to keep your desk or surface. If ink remains in the pot with the cap it is recommended that no throw the ink container and save it. Save this ink out of the reach of children in a cool, dry place. Place the cap on the ink tanks, the same cap that you have removed to fill the ink tank, do it slowly and carefully. 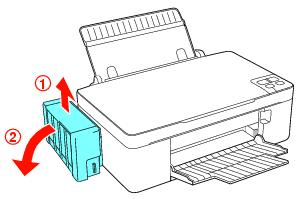 Grab the printer unit, the unit is the one that contains the ink tanks, follow the instructions to put it back, see them in the plastic that this unit indicates how to put it. Check ink blocking it is indicating when ink cannot keep coming out, it is on the bottom of the unit, when you see this picture is that it is open and how it should be. This image indicates that it can print with continuous ink system, this indicates that the ink system is not clogged can print at the moment. When you have this image it indicates that we cannot print, this is because the ink system is locking out and cannot print yet.